Gerber’s Empower auto-opening knives provide professional features with a more civilian flair. Gerber Knives has just announced the release of their new Empower Series automatic opening knives. 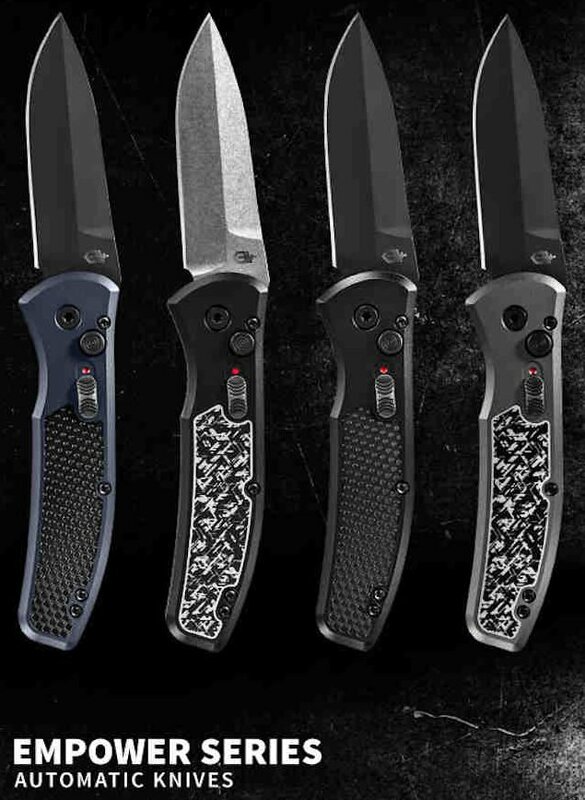 These new Empower knives are based upon the Gerber Propel, which was specifically designed for law enforcement and military users, but will offer more traditional blades and civilian-minded colors and textures. Gerber is one of America’s leading knife manufacturers. The Gerber Auto 06 is one of the most popular auto-opening knives on the market, and the Empower knives hope to expand upon that popularity with knives more attractive and practical to casually clothed civilians. EDITOR’S NOTE: BlueSheepdog does not sell advertisements on our site, and we do not have any affiliation with Gerber. This stance allows us to make honest and objective reviews, without the influence of advertising sponsors. BlueSheepdog does participate in the Amazon Affiliates program. If you make a purchase from one of our embedded links, Amazon pays us a type of finder’s fee. These payments literally keep this site up and running, and do not affect the price you pay. Thank you for considering us if making a purchase! The Gerber Empower in Grey provides a contrast in color and grip design. As we mentioned, Gerber is no stranger to making high quality auto-opening knives. The Auto 06 has been extremely popular. Now the Empower series of auto-opening knives look to bring quality and features in a more civilian-friendly package. The Empower series knives are offered in (4) separate frames and (2) blade finishes. Based upon the previously released and successful Propel knife, the Empower knives add the auto-opening feature so many knife enthusiasts prefer. The Empower blade is spring loaded, and released through pressing a plunger on the side of the handle. This plunger is also designed to act as one of two safeties. Once open, and the plunger released, the plunger will slide back into place and block the blade from closing. To be extra sure, Gerber adds a slide lock, with a red dot identifying the locked position. The slide lock prevents an accidental activation of the plunger making the Empowered knife extremely safe to use. The Gerber Empower blades are made from high quality S30V stainless steel. The S30V stainless steel chemistry promotes vanadium carbides distribution across the steel. Vanadium carbides are harder and better at cutting than similar Chromium carbides, making the Empower series knives fully capable of hard action, and not just show pieces. The Gerber Urban Blue Empower knife is unique and the most colorful of the series. Empower frames are Type III hard anodized aluminum providing superior corrosion and rust protection. Gerber then tops the frame with Armored Grips® handle plates. These plates look very sharp, and add the color to the knife handles. However, the Armored Grips do much more than add aesthetics to the Empower knives by actually improving grip and reducing slip. The grip handle plates are electro-formed to ensure the color and features are long-lasting. Finally, Gerber offers a reversible pocket clip for Empower users. This allows users their choice of blade tip up or blade tip down carry methods further enhancing the overall appeal of the Empower knives. Personally, I prefer blade tip down carry since I am usually carrying a flipper style folding knife in my front pocket. However, I know some strongly prefer the tip up carry method, especially if the blade can be made to deploy upon withdrawal. A traditional, but reversible pocket clip completes the Gerber Empower knives. Empower black with stonewash blade is perhaps the most unique of the series. Carry: Reversible pocket clip, blade up or down. 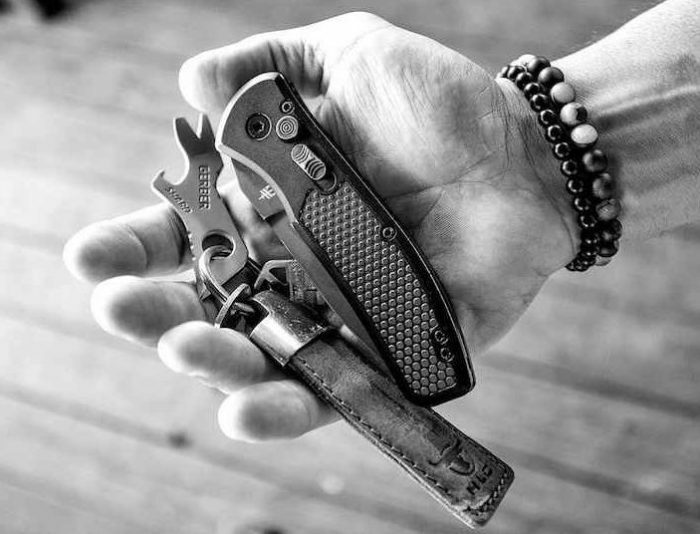 When folded Empower knives are just over 5″ long, but still concealable. Gerber announced the Empower knives at SHOT Show this year, and they are now out to distributors and retailers. We haven’t had the chance to get our hands on one yet, but we have had time with the Propel these knives are base upon. The Propel is a very nice knife with a smooth action and well-balanced feel. It appears the Empower knives will capture all of the good features of the Propel and simply provide a less tactical appearance. Overall I see a lot of good in the Empower knives. I know some knife users prefer to have at least some serrations on the blade, and that might be in the future from Gerber, but the razor edge kept sharp should be able to handle small and large jobs alike. EDITOR’S NOTE: Though many States have made auto-opening knives legal to carry, there are still a few States where it is illegal to carry an auto-opening knife. BlueSheepdog are not attorneys, and nothing we post is meant to be considered “legal advice.” We highly recommend readers search their local laws to determine if they are eligible to carry auto-opening knives like the Gerber Empowered. The Gerber Empower is sized nicely to fit well into the users grip. The (4) Gerber Empower knife options for comparison.